Here's another fun squash dish from this month's Cooking Light. I never would have thought to make a squash souffle (or put squash in cinnamon rolls, for that matter), which is why I love turning to magazines and cookbooks for ideas. I'm no expert on souffle making, so mine is not as pretty as the one in the magazine, but it sure tasted good. Airy and light, like eating a squash flavored cloud, if such a thing were to exist. Hehe. Anyway, this makes a lovely light dinner with a side salad. Now on a separate note, I need your help. I have a busy couple months ahead as I finish up (!) my Ph.D. thesis. While I love cooking dinner from scratch after work and find it to be great stress relief, it doesn't work so well when I come home late, already starving. I still want to eat home-cooked food, so I'm planning on spending some weekend time cooking make-ahead meals as well as some freezer-friendly dinners. I have a tendency to want to make things that really do not fill these criteria (like um, souffle, for example), so I clearly need your ideas! I'd love to hear about your favorite recipes and get some new inspiration. What are your favorite make-ahead or freezer-friendly meals? This recipe is written to make 5 individual souffles. I made a larger one, and it worked fine, just took longer to bake. Preheat oven to 450 deg F. Toss cubed squash with melted butter, olive oil, thyme, shallot,1/4 tsp salt, ground pepper. Place squash mixture in a small baking pan and roast in preheated oven, turning once, until squash is tender and can be pierced easily with a fork, about 20-30 minutes. Allow squash mixture to cool slightly and then puree in a food processor until very smooth. Reduce oven temperature to 425 deg F then put a rimmed baking sheet in the oven. Lightly coat souffle dishes with cooking spray and then sprinkle bread crumbs all over the inside surfaces of the dishes. Combine flour and remaining 1/4 tsp salt in a medium, heavy saucepan. Place over medium heat and slowly pour in milk, whisking constantly. Bring to a boil and cook 1 minute (mixture should be thick and bubbly). Remove pan from heat and let stand for 5 minutes. Stir in cheese and mix until smooth. Add squash puree and egg yolks and stir to combine. Place egg whites in a large mixing bowl and beat with a mixer at high speed until medium peaks form. Gently fold 1/4 of the beaten whites into the squash mixture, then gently fold in the remaining whites. Divide the mixture evenly among the prepared dishes. Place filled dishes on the baking sheet in the preheated oven. Immediately reduce oven temperature to 350 deg F. Bake souffles until golden brown, puffed, and set, about 45 minutes (or about 55 minutes if you use a bigger souffle dish). Serve immediately. 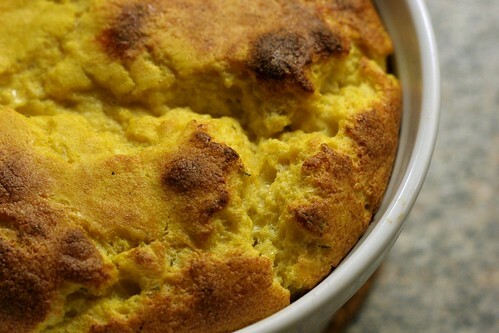 Yum - another lovely squash recipe! Congrats on getting close to finishing your PhD - that's amazing! I work at a University and my Masters thesis was crazy, so I know it's a trying and stressful time. I think that any sort of slow cooker meals (stews, spicy chicken you can put on a tortilla with some toppings, goulash - one of my favorite is a pork and pepper one, it's posted on my blog) and large pots of soups, chilis, etc. are great for you. You can do a quick prep and the slow cooker aroma is there to meet you when you walk in the door. Or, you make a large pot of soup on Sunday and just heat it up when you get home through the week. Good luck! Thanks Amy! Yes, I definitely need to use that slow cooker more often. I love coming home and smelling dinner already cooked! So pretty! The butternut squash and cheese combo in them sounds soo good. PS - Congrats on being so close to finishing your Ph.D! oh this is so pretty! what a great fall meal! Another excellent use for squash! I never make souffles - why?! Italian-style meals like lasagna or meatballs usually freeze well. And chili too. When I'm lazy, I tend to rely on lots of chicken sausage! Emily, you read my mind. I made a lasagna and meatballs today, and they are both in the freezer now! Just got a bunch of butternut in my Boston Organics and needed new ways to make them. Yum! I basically make everything ahead of time and then take it for lunch, so I think just about anything goes. But I do tend to find myself making a lot of stews and soups! They make HUGE batches and actually taste better as time goes on! 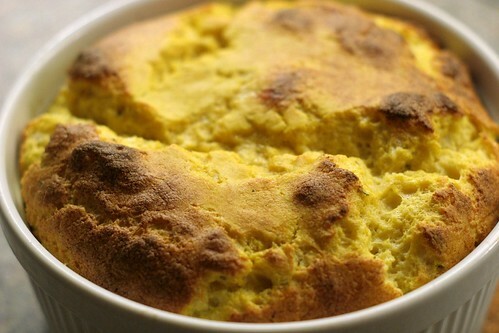 I think your souffle looks superb! aaaah, i've been wanting to try something like this :) i cook almost all of my food ahead of time to bring for work, so i really do think anything goes! I have learned to slightly undercook things (as long as its safe), and add a little extra liquid to compensate.